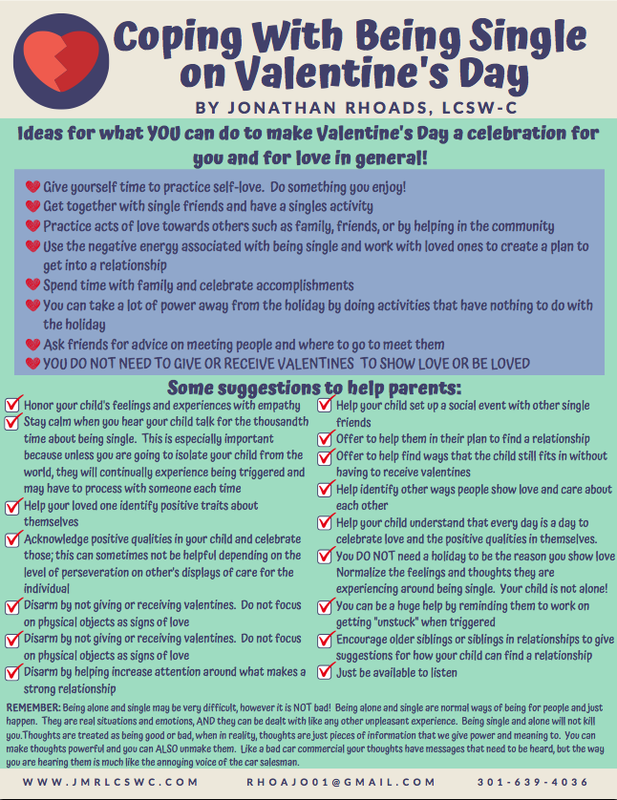 JMR Counseling: Unhappy Valentine's Day? It Does Not Have Be That Way, Even If You Are Single! Unhappy Valentine's Day? It Does Not Have Be That Way, Even If You Are Single! 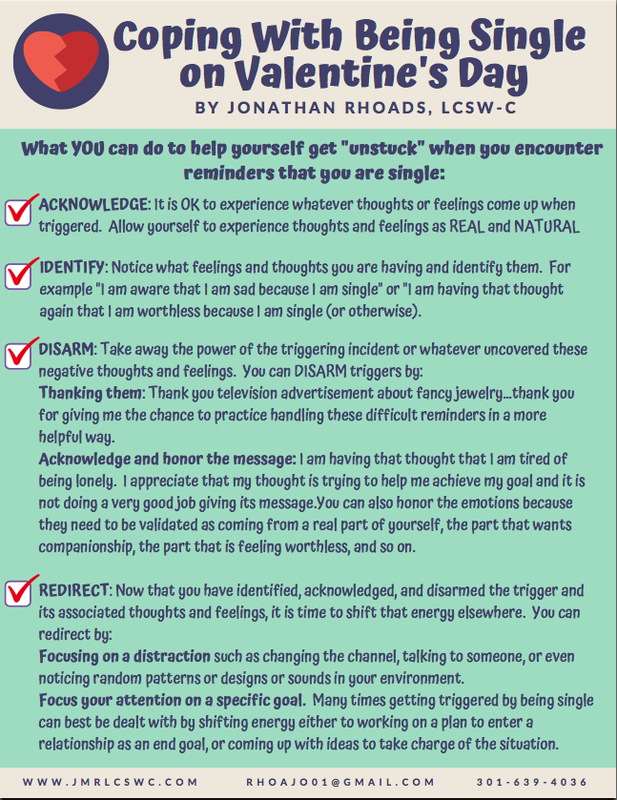 While the weeks leading up to Valentine's Day come full of reminders to celebrate our love and special relationships with gifts, for many of us, Valentine's Day and the time leading up to it brings the reminders of being single and lonely. (Please see my post for December about coping with loneliness during the holidays for a more detailed discussion of causes of loneliness and its impacts on sense of self and quality of life.) For many of us, hearing ads saying to show your love with expensive jewelry, or rose bouquets, or deals for couples, serve as harsh reminders that we are not in an relationship. Often times, although not explicitly stated, the message "show off your romance for the world to see!" or "show everyone your love" is sent through such advertising at this time of year. It is also considered socially and culturally acceptable to engage in more public displays of affection as well. Please note that I am in no way trying to suggest that people need to feel guilty for showing their affection for their partner, in fact quite the opposite! Merely, I am aiming to draw attention to a very visual source of distress and frustration for our loved ones who are single and struggling to enter into a loving, romantic relationship. With the ever increasing presence of social media and instant status updates, various social media platforms are ever the source of further reminders of someone's single status. Being confronted with images or videos of friends, loved ones, or even strangers seemingly engaged in a happy romance, can be quite distressing. It's not uncommon at all for singles, male or female or transgender, to quickly involute and turn in on themselves to try and find answers to why they are single. For many with poor self-acceptance, being reminded of being single is the same as being reminded of being a loser. In a world where social media is there to show social popularity and, especially, fitting in, the very real images that we are not part of highlight this social goal with brutal clarity. For example, I remember as a kid, before social media (to date myself), that it was very easy to forget about other students in class and being popular when not in school, because let's face it, my mind was not developed enough to really engage in or care that much about what other kids were doing or who they were hanging out with. Come a holiday like Valentine's Day, every student had to give the other students a Valentine, no question. It was really easy to get caught up in the hype and feel like you were the most accepted student in the class and that everyone was your friend because you got a Valentine from everyone. In basic concrete thinking a Valentine was given to show care and friendship; therefore getting one from every student naturally meant they were a friend. For me, Valentines were the equivalent of "likes" for the 90's. Now let's fast forward to today where we grow up and, of course, learn that giving a Valentine is a social nicety but does not mean you are friends at all. With social media use being used by kids who are younger and younger, this message is being made all the more clear, especially when their peers are posting pictures of all the fun stuff they are doing with other peers when they are not invited. "But I got a Valentine from them! Why did they leave me out! I thought we were friends!" What confusion and frustration! What disbelief! And what a rough way to come to the conclusion (however wrong but since we are being conditioned to view likes, number of comments, friend requests, and physical items like cards or candy as true measures of friendship and worth) that I do not fit in and do not have anyone who cares about me. For the older kids and adults, giving classroom Valentines has transitioned to what we see/hear in the ads and what we see people posting about romantic trips or dinner dates. Again, these reinforce the concept that romantic relationships are socially important and special. The consumerist aspect further adds a frustrating layer of commodification and an association of wealth with quality of relationship. These points noted above, are especially difficult for young people with disabilities and developmental diagnoses. In essence, the exposure is setting a goal that is largely unattainable, at least according to the images being conveyed via advertising. If anything, this time of year is for many with such diagnoses, extremely difficult because it highlights people who are "normal" as the only ones able to be successful achieving a goal which is a huge challenge for many with developmental diagnoses: social acceptance and inclusion. As we continue to learn more about how the minds of individuals with developmental diagnoses work, we are learning that they desire inclusion and acceptance with mainstream society. Having difficulty with social skills and other challenges adds layers of further difficulty, which gets compounded by the lack of societal understanding of these diagnoses and how they exactly impact the lives of those with them. We are still very much in a society that views people who do not fit societal images of normality as being "other". When these views are reinforced with all the reminders of what sets the "other" apart from the normal, especially when linked to subjective emotions like love and naturally normal desires for love and companionship (as in advertising or social media) it is very common for these natural needs to become seen as unattainable. For individuals who so want to be accepted like everyone else, having a developmental diagnosis and the knowledge of its limitations and challenges on being able to achieve the socially defined goals of acceptance, greatly contributes to the presence of self-hate and shame. That said, it does not have to be this way, whether for someone with a developmental diagnoses or any other child or adult who "does not fit in". Here is a helpful (hopefully) handout with some ideas on how YOU can take the power of determining whether you have worth and are worthy of having a romantic relationship, away from the consumerists and turn this time of year from one of exclusion to one of inclusion. Best of luck, YOU deserve it! Another excellent blog post by Jonathan Rhoads. Jonathan, You have an amazing ability to break down complex topics and concepts into digestible bites and present them in a visually appealing way. I always look forward to your next post.